Some have been wondering if Bing would follow in Google’s footsteps and do a Mobile First Index, similar to what Google recently announced. Google will be changing their desktop index to one where they index the mobile version of a website, in order to serve mobile users – which now account for more than 50% of all searches – the most accurate search results. 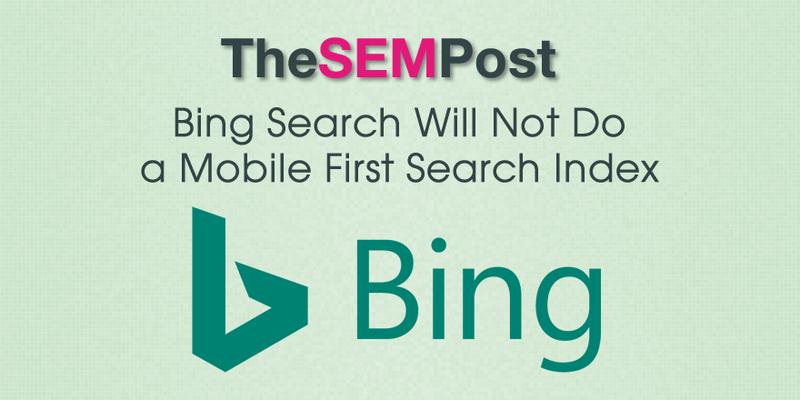 Christi Olson from Bing says that they have no plans to do a Bing “mobile first” index. Their index will remain as a desktop index, meaning they will continue to index the desktop version of a webpage, and not the mobile version of the page. “At Bing, we maintain a single index that is optimized for both mobile and desktop to ensure our users continue to receive the most relevant, fresh and consistent results no matter where they are,” Olson told The SEM Post. Bing definitely has a smaller market share, when compared to Google. But perhaps they aren’t seeing more than 50% mobile searches on Bing or perhaps they would rather place their resources in other areas of search. This does have some repercussions though. For those sites that consider Bing an important traffic source will now have to optimize the mobile version of a page for Google, while having to optomize the desktop version for Bing. For responsive sites, this won’t be such a big deal, but for sites utilizing a m. mobile strategy, where desktop and mobile share completely different URLs and content, this could mean a significant amount of extra work to Bing optimize. This also makes Yahoo Search interesting – when they serve Bing results, they will be serving desktop results, but when they serve Google results, they will be serving mobile results.